This article or section refers to the version '10.1/10.2' and it is now obsolete! The storage system developer Areca has developed and release several types of hardware RAID controllers. 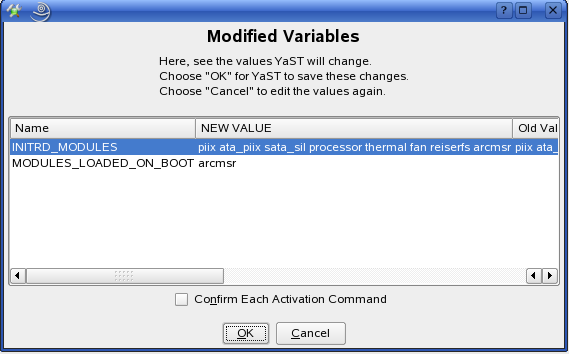 Along with the typical PCI-X controller cards (ARC-11XX Series) that are used on many servers, they also released a series of cards (ARC-12XX) that run on the new PCIe bus. The availability of scaleable PCIe RAID controllers is important because it allows the SOHO server builder to use commonly available (inexpensive) components to build solid and high-quality storage solutions at a fraction of the cost of full blown Xeon/Opteron solutions with just PCI-X support. Moreover, the PCIe system bus has higher overall bandwidth overhead for improved scaleability. Releases from 10.3 onwards already have the driver installed since it was merged in kernel 2.6.19. The manufacturer has provided a pre-built driver for 10.1. But not for the kernel update to 2.6.16.21. For 10.2 and earlier, we are going to need to build the driver and install it manually. Don't worry, this is pretty straightforward. Warning: If you are using the manufacturer driver disk for release 10.1, do NOT upgrade your kernel with the security update, if your boot partition is on the raid. If you are compiling the raid module for your machine with this manual, your system will stop working. You can build the driver for openSUSE release 10.2 only on the same machine where the controller is installed (in that case, you need to install on a different disk than the controller's one) or on a different machine (provided that it has EXACTLY the same openSUSE and kernel version). First, get the most recent version of the driver sources from Areca's FTP Server and extract it in some place (maybe the root users home folder). You can build a driver update diskette and boot off directly from the machine, doing the openSUSE installation at the same time. Download the driver diskette update image from Areca FTP site  (10.1 version is fine), write the image on a floppy, and mount the floppy. Open the floppy and move to the directory where system updates are installed (/floppy/linux/suse); copy the x86_64-10.1 or i386-10.1 folders to x86_64-10.2 or i386-10.2, respectively. Enter your preferred folder and go into install, then extract update.tar.gz. Cd in lib/modules and copy one of the folders to a new one, giving it the name of your kernel (uname -r will help). 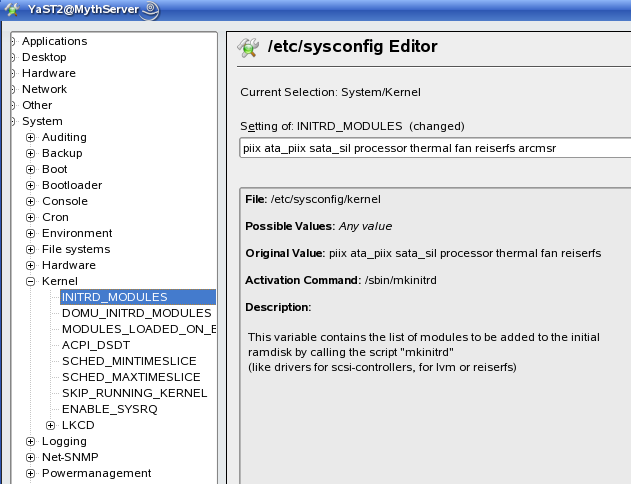 Inside this newly created folder cd to kernel/drivers/scsi and subsitute the driver module arcmsr.ko with the one you just built (WARNING: remember to build the kernel module on a machine with exactly the same kernel version, openSUSE version, and CPU architecture of the one you will install openSUSE on). Go back to the directory where you extracted the gzipped tar, delete update.tar.gz and compress the lib folder with tar and gzip, afterwards changing its name to install.tar.gz. Now modify the patch scripts in /floppy: patch.i386 or patch.x86_64. Open one of them with your editor and change all the occurrences of "10.1" to "10.2"; go to line 36 and change the kernel number in the if command to match your version (leave the * at the end): e.g., the existing 2.6.16.13-4-* should be changed to 2.6.18.2-34-* for a brand new 10.2 install. Thats'it! Save the file and close the editor, unmount the floppy, and prepare to boot the new machine. When booting for installation, at the first screen, choose F5 and select "YES": this will cause the installer to ask you the floppy with the drivers. Now, start the installation; at some point, it will pop up a window where you have to specify where the driver update medium is located: insert the just prepared drivers floppy and select fd0. 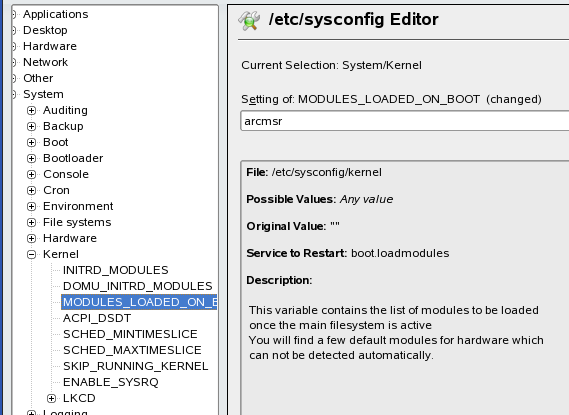 Also, install configure the module to be installed at boot. After you reboot the machine, you should be able to see the new space from the My Computer dialog on the desktop. This page was last modified on 19 June 2013, at 03:49.